26. Cashflow Sensitivity Analyses – Be Careful - KJ Kuchling Consulting Ltd. Tagged: 43-101, Cashflow Model, Feasibility Study, PEA, Study Management. ‹ 25. Junior Mining – Are People Still Investing? To be frank, this is one section of a 43-101 where I don’t bother wasting my time reading. Even metal price sensitivity can be distorted if the mine produces more than one product, which is more often than not the case. 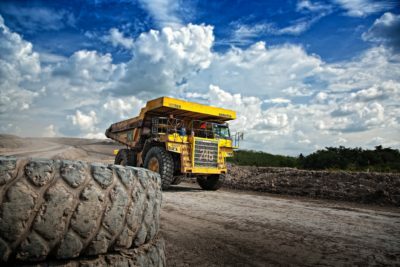 What I DO look at is the metal price assumptions, the capital cost estimate, the operating cost estimate, the resource estimate (for how tonnes and grade are calculated) and the estimated recoveries. If these factors are reasonable then the cash flows will likely be reasonable. Most financial houses can supply metal price estimates, and one can develop a more or less “normal” distribution if one has 20 or more of them. It’s a simple matter then to decide how much risk to take on metal price. I generally drop back by one sigma to ensure my assumed price will be less than the consensus at least 83% of the time. Grade and recovery have killed a lot of mines, so I pay a lot of attention to how the resource grade was determined and how much metallurgical work was done. Cash flow is very sensitive to these two factors. Issues such as the composite length, block size, geological constraints, etc need to be correctly determined for the orebody in question. Any sensitivity should include these factors. Lastly, one needs to decide what discount rate is appropriate. Most operators would accept 8% in today’s world for an operating mine, but not for a project. Projects still carry significant risk, and therefore should be evaluated at a higher discount rate. If the project is at FS level a discount rate of 15% might be acceptable. At any earlier stage the discount rate should be even higher. 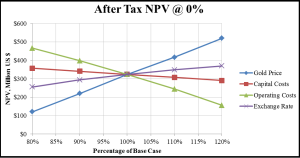 over at Jack’s site there was a very interesting discussion on decoupled NPV. (DNPV) by David Esponoza and Jeremy Morris. 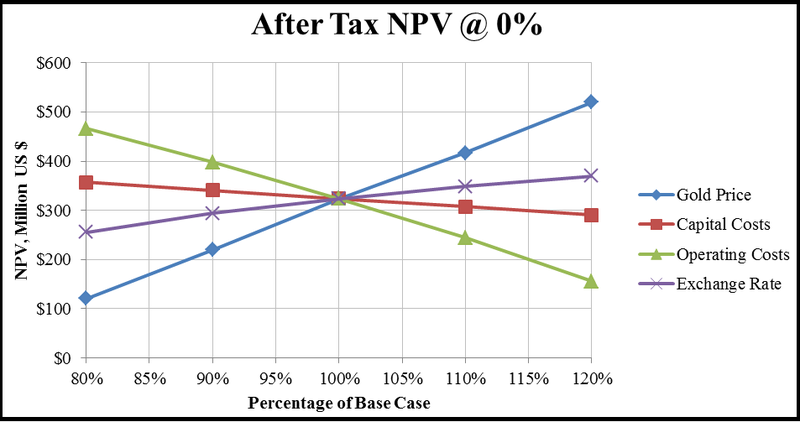 It’s worth reviewing their work to learn how they de-risk NPV.